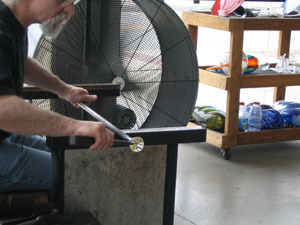 I began my glass art experience at Louisville Glassworks. I met with Page Von Wheeler who is part of a studio called Architectural Glass Art. AGA and Glassworks occupy a large building in downtown Louisville, KY, which houses studios for other glass artists, galleries, and a terrific hot shop. 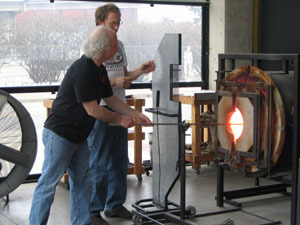 Page introduced me to Chad Balster, who became my glassblowing mentor in the months of March and April 2006. 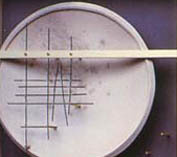 I worked with Chad through several sessions. I don't see myself becoming a glassblower, but this introduction presented me with many other possibilites among a wide variety of glassworking techniques that I feel will become a major part of my studio life in the very near future.